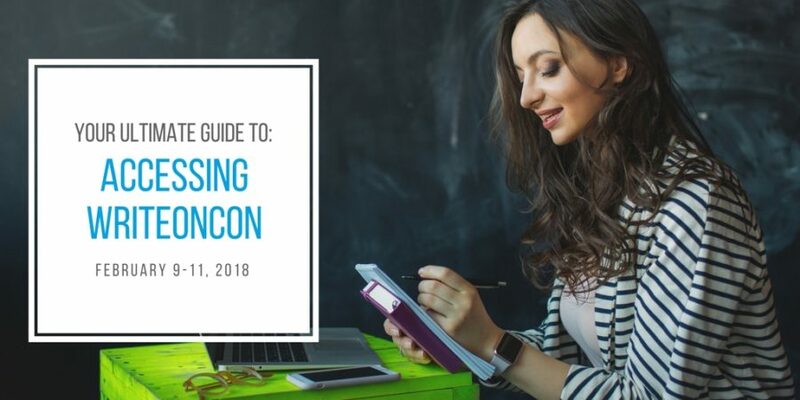 WriteOnCon 2018 is just around the corner! So here’s everything you need to know about accessing all of the amazing events and conference content. You can check our schedule to see the full line-up for 2018, and our guide to the icons if you want more details. And then right here, we have the details on how to get to all these cool events! Depending on the level of admission you purchased, you will have access to different portions of the conference. Attendees who have not purchased admission will be able to access our keynote events only. These are posted at the opening and close of each conference day — there are six in total. We have selected six of our favorite topics, which we hope will be useful and inspiring to everyone! These events will be on the main blog (the place you’re reading this post right now). Purchasers of General Admission will have access to our static events, but not the live events. These include all of our blog, vlog, and podcast posts — all 49 of them! Our contributors have created some incredibly helpful and eye-opening posts (we had a terrific time reading them as we set up for the conference), from writing advice to insight on career-building and the publication process, so there’s lots of great stuff here to help you on your writing journey. These events will be on the conference page. Those who bought the Full Admission will have access to all of the above, plus the live events. We have 34 live events lined up over the three days of the conference — one every hour, on the hour! These include Q&A sessions with industry professionals (authors, agents, and editors), pitch sessions, and even live workshops. These events will be on the conference page and the live events page (you can catch them on whichever one you fancy). And finally, everyone with Extended Admission will receive exactly the same content as the Full Admission. However, while both General and Full admissions will close at the end of the day on February 18, Extended Admission attendees will be able to access content until March 11. Regardless of your admission level, the critique forums are open and free to everyone. You can access the forums from our website, or directly by going here. For more information on how the forums work, please see our blog post for instructions. Everyone who pre-registered for the conference will have been automatically added to our conference registry. You should have received an email containing login and password information. If you have not gotten your login info, please email us. NOTE: The email address we sent your login info to is the one you used when paying. Please check that account — including your junk and spam folders — before emailing us. You can change your preferred email address once you log in. New registrations made through our website will receive an automatic email containing their login information. This login is your key to the conference events. You will need to log in using this information in order to access the content that you registered for. All conference events can be found at the Conference Events link in the navigation bar. All events are listed, but you will only be able to access the ones that you bought admission for. Live events are accessed through our Live Events page. Only Full and Extended Admission attendees will be able to access the events on this page (though everyone can see a preview of the posts). All events will be embedded into the Live Events page for easy organization and access. You will need to be logged into your WriteOnCon account to leave a comment on the post. These comments will be pulled by the moderator for Q&As, pitch sessions, and workshop critiques. If you missed a live event while it was live, don’t panic! All live events will be archived for you to be able to catch up on later (you just won’t have the opportunity to interact with our live speaker). If you have not yet registered, there’s still time! We will be accepting General and Full Admissions right through February 18, and Extended Admissions until March 11, which are the days when these respective admissions expire. You can register here. All conference content — keynotes, blogs and vlogs, podcasts, and archived live events — will remain available right through the admission expiration dates. You can continue to access it using the same login and webpage links as during the conference. We are incredibly excited about what we have lined up for you during WriteOnCon 2018! We hope that WriteOnCon helps you improve yourself as a writer, and also leads to some wonderful and lasting new friendships. Could you please post a key to the icons on the schedule? Thanks! I’m trying to plan my 3 days at the con, but I don’t know how long each event will be. I don’t want to assume each one is 30 minutes, so can you give a basic idea of the length? Thanks! No problem! Live events will typically run for about 50 minutes. Of the static events: Podcasts are about 30-40 minutes each (depending on the individual podcast), with vlogs ranging 10 minutes to an hour long. And, of course, blog entries can be read at your own speed. Thanks so much! That’s a huge help! Just want to say thanks so much for providing us with this fantastic conference. I won’t be able to do it all live so am glad that I can have a month to read it. Natalie @ Literary Rambles. We’re glad you’ll be able to catch the content! And thank you so much for the shout-out on Literary Rambles. We’re big fans of all you do! Please correct me if I am wrong but I thought that events from last years conference in 2017 would be available as well since you attained your stretch goal. Where would I be able to find it in that I have tried looking around the site and am having a hard time? Again correct me if I am wrong. You’re not wrong! The events from last year are available to people who contributed to our fundraiser. To access them, go to your dashboard and the link should be there.